At the heart of Shizen is a unique concept, the first of its kind in Israel, which aims solely to impart a sense of comfort and serenity. The focus is on the smallest details, those that transform a stay at the spa resort into an intimate and unforgettable experience. The warm personal service begins as soon as you arrive. A hostess greets each guest and check-in is carried out while sitting over a cocktail. The spa resort offers 40 elegant, spacious boutique rooms, designed in the Japanese style with authentic furniture, for a truly enchanting stay. You can begin each day basking in the magnificent view of the sea from your bed. For complete relaxation, you are invited to an extraordinary spa experience in one of The Shizen Spa's 18 treatment rooms. The Spa offers a wide variety of massages and treatments, both new and traditional Far-Eastern treatments, such as Ayurveda, four-hand aromatherapy, Alpine Montana and Indian hot or cold stones. The Shizen Spa also offers an indoor pool, wet and dry saunas, a pampering Jacuzzi, gym, and a variety of classes, including aerobics, yoga and Pilates as well as lectures. Guests also enjoy an outdoor pool and direct access to the beach during the warm season. The Shizen Yapas Bar serves up an unforgettable culinary experience. The restaurant is the creation of Chef Colin Gillon and brings together the Japanese kitchen and the Spanish tapas concept with a Mediterranean touch. Yapas are a perfect fusion of flavor and style. The Shizen Yapas Bar is a unique restaurant that is perfect for intimate encounters - business or romance. The Shizen Lifestyle Spa Resort invites you to an intimate-romantic relaxation experience that will leave you wanting more. Shizen is the place to enjoy precious serenity and joyous moments: such as wedding nights, anniversaries and birthdays. 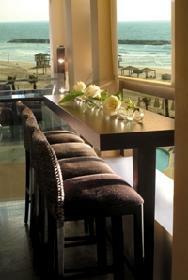 The Shizen Lifestyle Spa Resort on the Herzilya seafront, offers 40 elegant and spacious guestrooms. The rooms are designed in a gentle, romantic style, integrating warm, earthy colors and making use of natural materials. Wooden parquet, intimate lighting, and a bed that offers soothing views of sea and sky, make Shizen accommodation a relaxing and truly unique experience of awareness and tranquility. Being Shizen, great attention has been paid to the smallest details. Each room contains a wide selection of candles, incense and aromatic oils, while soft robes await guests, to ease them into the mellow atmosphere. Each room also includes a balcony, bath, mini-bar, hairdryer, safe, radio-CD player, TV, air-conditioning, Internet connection, coffee corner, desk and telephone. You are warmly invited to experience Shizen hosting, a pampering encounter for all five senses that begins from the moment you enter your room: a mini tea-set awaits you on the table with delightful seasonal delicacies, while in the background restful music plays, according to your own personal choice. 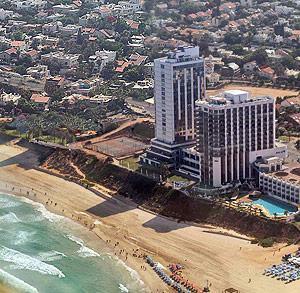 Located on the scenic Herzliya Pituach beachfront, the Shizen Lifestyle Spa Resort is positioned in the Herzelia-Pituach business district and just 10 kilometers from Tel Aviv on a major freeway. This outstanding location allows guests to benefit from convenient proximity to Israel's busiest business districts, while enjoying fresh sea breezes. The Shizen uniquely combines a corporate location adjacent to a business park, with tranquil sea views and nearby trendy bars and cafés.